Egypt’s ousted Islamist president Mohamed Morsi said he has refrained from eating in prison, fearing for his life, in a trial session on Saturday, an eyewitness said. The former president, ousted by the military in July 2013 following mass protests against his rule, addressed the court saying he faced “five incidents inside prison which posed as a direct threat on his life,” the eyewitness said. If Morsi had eaten the food he was offered in prison on July 22, he reportedly told the court, it would have led to a “crime”. The former president requested that he be inspected by a medical committee due to his “worryingly low blood sugar”. He also called for a meeting with his defense team to inform them of threatening “incidents” he faced. Morsi, who became Egypt’s president in June 2012 after the first democratic elections in the country, is facing trial alongside 10 others, including two of his aides over accusations of leaking classified national intelligence to the Qatari intelligence. The trial was adjourned until Sunday. 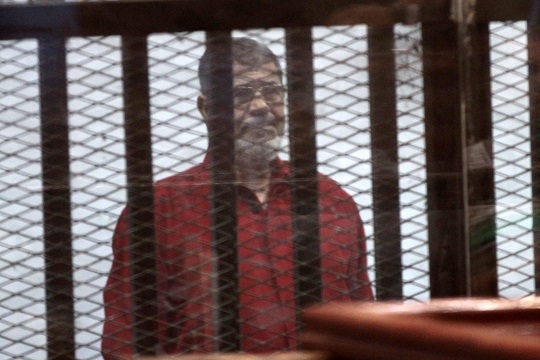 Held in custody since his ouster, Morsi has faced five separate trials and was convicted in three of them. He was sentenced to death in a prison escape trial and was sentenced to life in prison for an espionage case in June, both by the same judge. In April, the former president was found guilty of show of force and detention associated with physical torture of protesters during deadly protests in 2012. He was sentenced to 20 years of maximum security prison. All three sentences are not final and are subject to appeal. He is facing another trial for insulting the judiciary. Morsi’s ouster was also followed by the arrests of dozens of Brotherhood leading figures, many of whom feature along his side as co-defendants in trials.